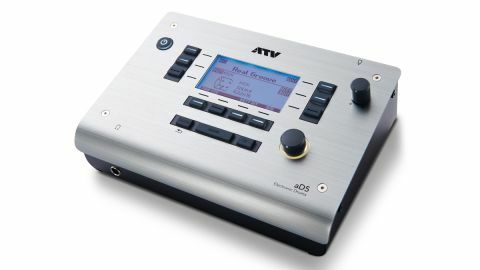 The aD5 combines realistic samples with an impressive dynamic range which makes for a gratifying playing experience. Despite The ATV corporation being the new kids on the block in the music tech world, having been established by Roland founder, MIDI inventor and straight up living legend Ikutaro Kakehashi undoubtedly gives the company some clout in its field. With a tactile synthesiser on the way soon in the form of the 'aFrame', ATV has first rolled out a standalone electronic drum module; designed to work with trigger pads from most major brands. Bar a single quarter-inch headphone output on the front of the unit, all connection ports are located on the back. Here we find left and right jack outputs, a stereo mini-jack 'audio in', a 25-pin multi-trigger input (which uses a supplied jack cable loom, pre-labeled for each pad), two inputs marked 'Aux 1/2' for additional trigger expansion, an SD card slot, a USB port (for USB MIDI functionality) and an ethernet port marked 'ATV Link'. The latter will enable the aD5 to be connected to other devices following future firmware releases. The multi-trigger cable includes right-angled quarter-inch pad inputs for kick, snare, tom 1, tom 2, tom 3, hi-hat, hi-hat control, crash and ride. The module is supplied with a plastic mounting plate which, using an inbuilt hinge, can be adjusted to a wide range of angles. This means it can even be attached to a basic cymbal stand. Taking this a step further, there is also a thread in the bottom of the unit enabling it to be screwed directly onto a mic stand. Using the supplied multi-trigger adaptor, we had the pads from our existing Roland kit plugged into the module in no time. Within the aD5's trigger settings menu it is possible to choose from an ever-growing list of specific hardware, in order to optimise the compatibility of your existing kit. We were surprised to find even some of the older pads from our frankly vintage e-kit, as well as newer ones on the list. To reduce the legwork of this process, ATV has created installable set-up files for various Roland, Yamaha and Drum-Tec kit configurations. Each minute change in velocity appears to draw a new sound out of the kit as we play. There are a couple of other really nifty features built into the software which make getting the aD5 up and running with your existing kit an absolute doddle. When running the 'Trigger Setup Wizard', we are asked to play three quiet notes and three loud notes within each zone of any given trigger in order to fine-tune each pad. The 'Crosstalk Cancel Wizard' does exactly what it says on the tin - by essentially whacking every pad in turn, the software detects any misfiring and nips it straight in the bud. The aD5 currently comes with just five kit presets, ranging from Metal 9000 to Legacy Jazz, although it is possible to buy more kits from the ATV store. At this stage it is not possible to use your own samples but that does appear to be on the cards in the near future - presumably that's where the SD card slot comes in. The existing sounds include samples from a Slingerland Radio King, Yamaha 9000, Ludwig Mahogany and Gretsch Maple. Although limited in quantity at this stage, the samples have a realistic quality which results in a satisfying playing experience. This is embodied by subtle tuning nuances in the drums, like the familiar growl of a floor tom or the slight pitch-bend of a rack tom. With this in mind, it is worth adding at this point that there is little ability to edit the sounds or control ambience within the unit. However, combined with no noticeable latency, the sheer range of dynamic response goes a step further in making the aD5 feel more like a truly musical instrument. Each minute change in velocity appears to draw a new sound out of the kit as we play. The real high-impact samples wait expectantly until you really dig in. This is particularly effective in bringing longer notes out of floor toms or maximum punch from the kicks. Despite some impressive features, the aD5 does feel slightly unfinished at this point. The hardware is all in place but the software is still being tweaked in order to unlock its full capabilities. With firmware updates coming thick and fast though, this potential is likely to be realised sooner than later. In its current guise the aD5 represents a great option for drummers looking to upgrade an ageing module, or to build their own e-kit from scratch, and a worthy alternative to the other big electronic percussion names.